We had a short exhibition between Saturday 16th March to Saturday 23rd March 2019 at the Old Imperial Cinema in Occupation Road, Peterborough PE1 2LJ. On the 23rd we shared the venue with ART OUT II until around 8pm. This was an event organised by a local artist, Jaroslaw Sokol, where other artists were exhibiting their work for sale. There was also a wide variety of live art and live music performances. We sold 2 paintings and loads of cards. It was an exciting new adventure. Our members had a great time at out February still life meeting. As you can see from the photos opposite, we almost ran out of tables. We also held our annual Chairman's Challenge judging. The winner and runner up were Sandra Harper and Gitana Bankuaskiene. Both of our main exhibitions this year have been a roaring success. The society sold 21 paintings, 4 from the browsers and 17 from the boards in the Annual Exhibition, and 19 paintings 8 from the browser and 11 from the boards for the Autumn Exhibition. We also sold over £400 of members cards over the two exhibitions. The results for the Annual in June was helped by our exhibition coinciding with the Annual Peterboough Heritage Festival. We will ensure that it coincides with this same festival in 2019.. The Annual Exhibition also saw a record number of public votes for their favourite painting. 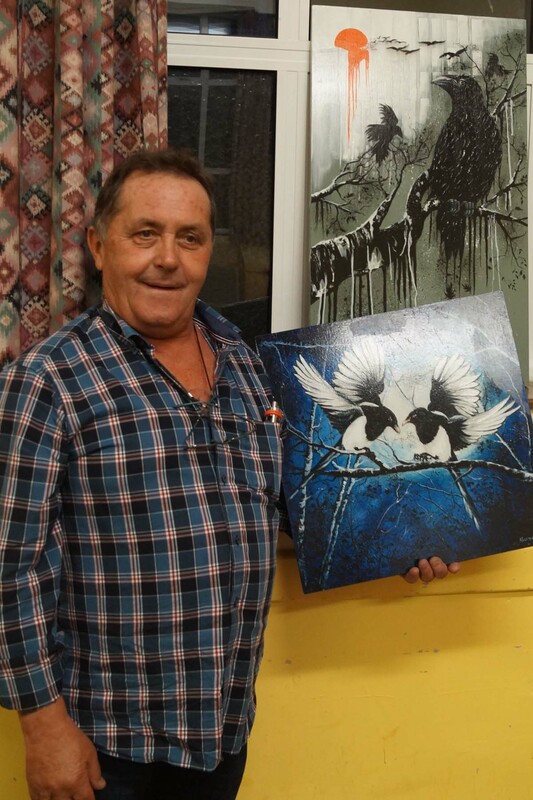 The winner was Stephen Kulczak's wonderful picture of crows painted in oils on board 'City Flyers'. Second place was Simon Anthony's 'The Shambles, York'. Joint Third place was Stephen Kulczak's 'Two for Joy' (two magpies) and Phil Hemsley's 'Winter Sun (Ferry Meadows). Photos show Stephen with his winner top, and 3rd place, and Simon with his 2nd place. .
A demonstration by Mo Teeuw on Monday 14th May was very inspiring, not just for how quickly Mo worked, but also the hints and tips she gave us about 'how' she works. Mo mosty uses brushes from Rosemary & Co. A lot cheaper that the top ranges, very good quality and long lasting. She also told us that she often uses acyrlic paint mixed in with her oils to help them dry quickly. She can produce a fair number of paintings when on her painting holidays, and they are dry the next day, to be able to bring home in her case. Mo runs residential course at home in Suffolk and also has just recently released a book on paintings clouds and skies in oils. See Mo's finished picture below. Also to see Mo's gallery and her book, see her website www.moteeuw.co.uk See some pictures from this demonstration in our events gallery. 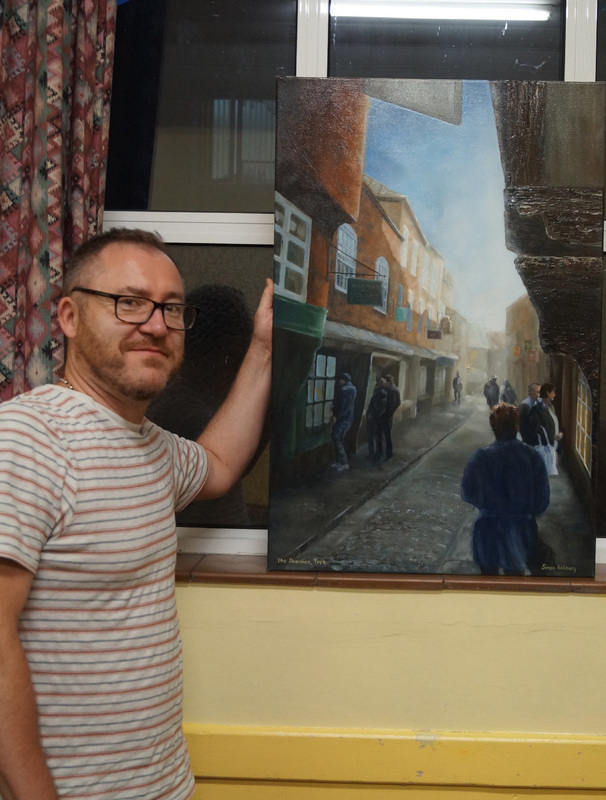 On Monday 16th April 2018 we welcomed local professional artist, Jerome Hunt to our meeting. Jerome gave us a good insight into his background and showed us some wonderful pieces of his work. He had a lovely still life display set up with a black background, which included a tulip in a glass vase, a lovely red apple and a silver jug. This was to show us how to paint glass, water and reflections. Jerome told us about a ground he uses to prep his painting board, and also told us that you can use something like the green Swafega to be able to clean brushes, rather than use expensive brush cleaners. Jerome advocates not using pure white in highlights, but adds a tiny amount of the object colour to tone down the white. See his finished picture below. 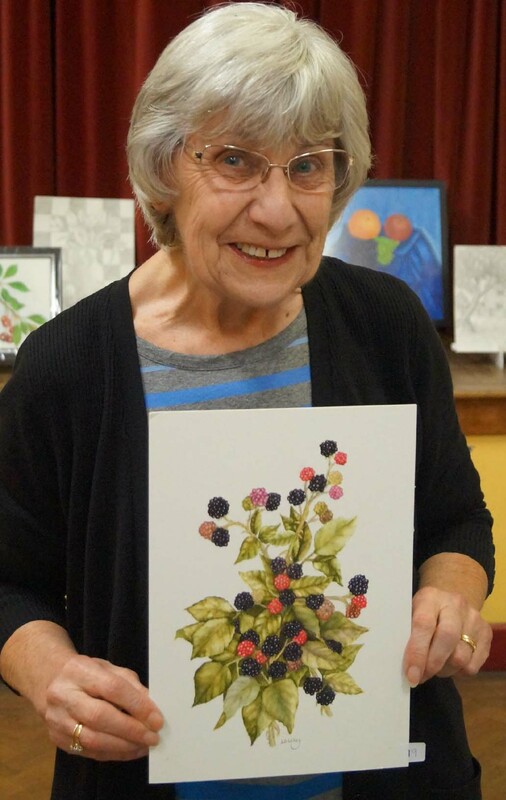 On Monday 5th March we welcomed local professional artist, Prue Pye to our meeting. She initially showed us a couple of ways she starts her paintings, using a very loose method of sketching a model, then adding some tones very quickly. She would then work on building up the image until she is happy. Prue apparently never paints faces or hands. She likes to suggest images for the viewer to add in their own mind. She then went onto a picture she had started before her arrival, with various tones of blue in acylic. She then started to add various tones of yellow in oil, leaving slight traces of the blue showing through. Prue then uses the end of a brush or knife, to scrape out the shape of her model. In between adding more paint to give tones and shapes. See her finished picture. Monday 5th February 2018 saw our members come together for our 'Critique' evening, where we also held our 'Fruit Challenge' competition. The objective being to create a picture containing something to do with fruit, being either a still life, fruit trees, or a landscape including a fruit theme. We had a total of 26 entries, which was wonderful The lovely display can be seen below. 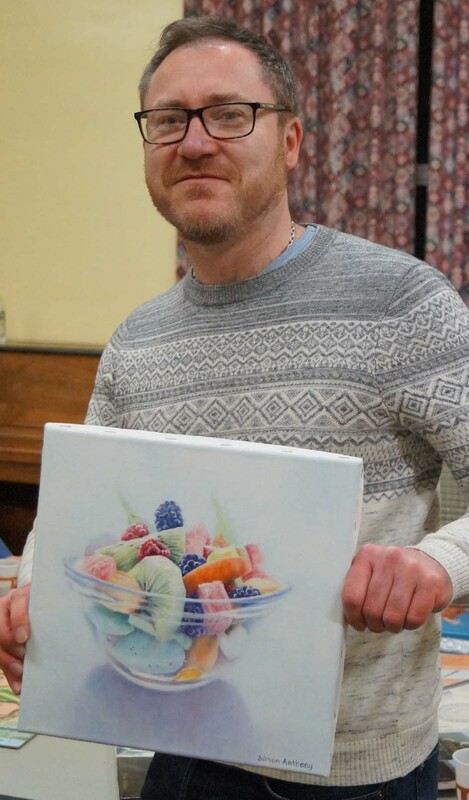 The winning entry was from one of our new members, Simon Anthony for his bowl of fruit. To paint glass is a great skill, and the way he captured such a soft effect was beautiful. 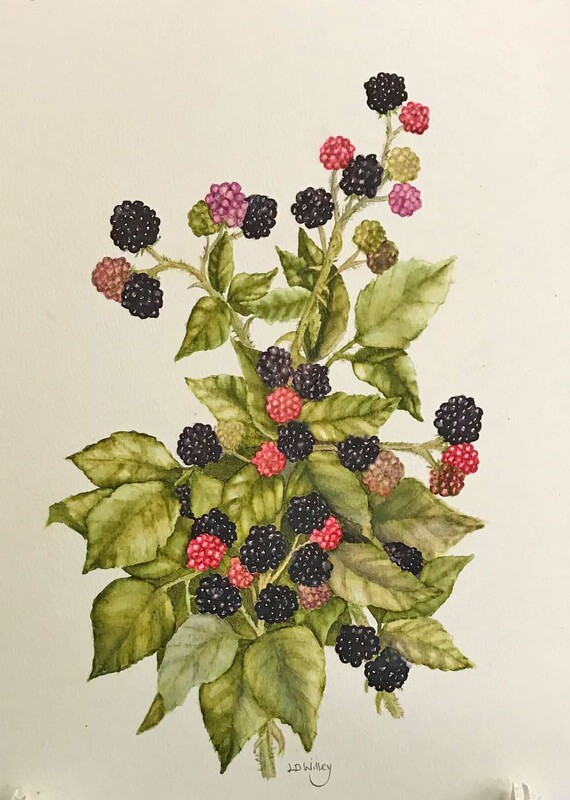 The runner up was a new member from last year, Linda Willey, with her image of a blackberry bundle. 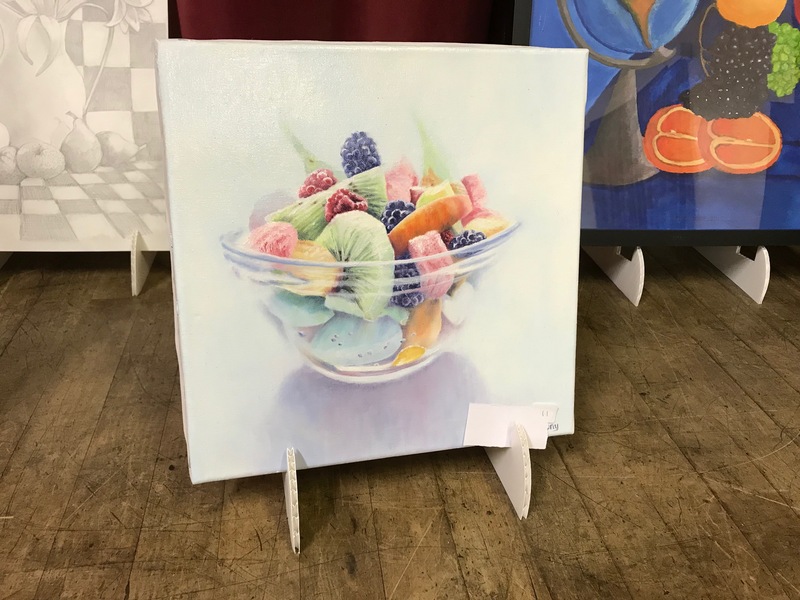 The way Linda captured the light on the berries in this painting was wonderful.